grape: Cinsault. Ths guy is usually part of a blend, especially popular in Chateauneuf du Pape and in the Languedoc, but rarely made on its own. Worth seeking out though. producer: Michael David. They also make 7 Deadly Zins, which a ton of people have tagged me while drinking. region: Lodi, CA. Lodi’s mostly known for Zin but they’re also doing a few Cinsault-only bottles lately. The Bechthold Vineyard is the oldest producing vineyard (128 years old) in Lodi. My friend who writes Hawk Wakawaka Wine Reviews said that a lot of wineries (like Turley, Scholium Project, Bonny Doon) also get their grapes from this vineyard. yum factors: Really light but packed with flavor. Some raspberry, a little blueberry, and a little herb at the end. Good acidity. Probably could’ve used a few more years to calm down a little but felt very lively. Really liked it and kind of perfect for a light fall wine. Tags: cinsault, lodi, wine. Bookmark the permalink. Interesting, I never had Cinsault on it’s own. All I know is that it was used to create the Pinotage grape they use in South Africa (by crossing it with Pinot Noir). At least once a month you give me a wow moment and this is yet another one. 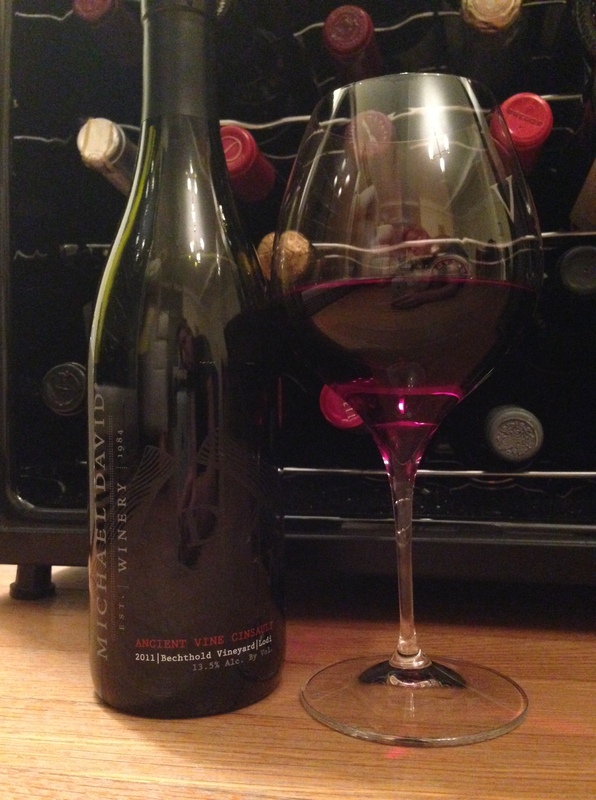 I am an avid Michael David Wines girl. In fact I am planning a tasting party with just his wines coming up. I love the Freakshow and Circa Circa. Thanks! Cool, so nice to hear! And for your tasting you should definitely get this Cinsault – it’s my favorite of theirs that I’ve had. Micheal David impresses me with their ink blot series. I’ll have to check the Cinsault out for sure. I love the Neyers 100% Cinsault…but it’s the only one I’ve had. Yeah, the Cinsault isn’t their most popular but I’ve liked it best.